I am a resident of the state of California and this is my AR-15 rifle. I acquired it legally in late 2006 – 6 years after the passing of California’s so-called “Assault Weapons Ban”. I built it myself with standard household tools even though I had no prior experience. It was easy to build, it looks and shoots great, and best of all, it is perfectly legal. Here is how you can build your own. Step 1: Buy an off-list lower receiver through a gun dealer. Click here for details. Here is a list of “off-list receivers“. 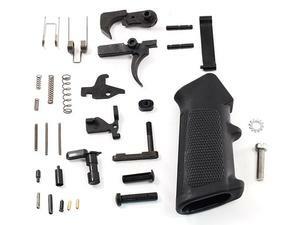 Step 2: Install a lower parts kit (trigger, hammer, safety, etc…). Step 3: Add a magazine lock, 10 round magazine, and a standard pistol grip or install a California legal grip. Step 4: Add a stock and you have a completed Lower Receiver Assembly. Step 5: Add an Upper Receiver Assembly and your California-Legal AR-15 is ready to shoot! Q) How is this legal? A) The Assault Weapons Ban in California bans specific makes and models of rifles by name. If you did not own one of those rifles before the ban was passed in 2000 then you can not legally own one in California now. Since new rilfe manufacturers and models are created all the time, it was difficult for the California lawmakers to keep the list up to date. In order to handle this situation, they also banned any rifle that has specific characteristics that are common with the types of rifles they were intending to ban. These characteristics, commonly referred to as “evil features” consist of things such as pistol grips, flash-hiders, and collapsible or folding stocks. The primary feature they were concerned with was a removable magazine. If your rifle does not have a removable magazine then it can have any and all of the “evil features”. If your rifle does have a removeable magazine, then it cannot have any evil features. A product such as the Bullet Button creates a fixed magazine rifle. The MonsterMan Grip does not meet the definition of a pistol grip. By building your rifle using one of these products or other similar ones, taking care to fully understand the law, you can configure a legal AR-15 rifle for use in the state of California. Q) I have more questions, where can I get more information?